Looks like the lives of Issa and Molly will have a lot more ups and downs in the future. HBO has announced that they’ve renewed the Insecure TV show for a fourth season. An HBO comedy, Insecure stars Issa Rae, Yvonne Orji, Lisa Joyce, Jay Ellis, Y’lan Noel, Natasha Rothwell, and Amanda Seales. 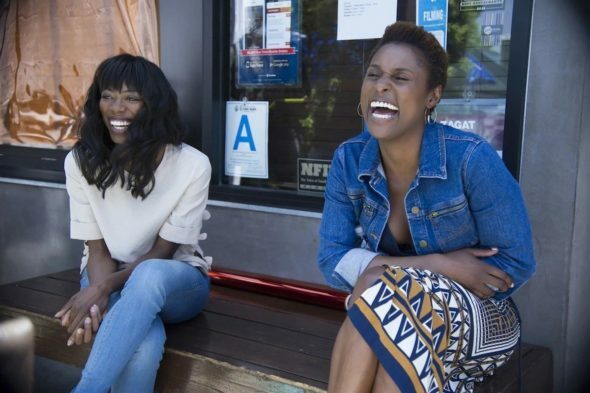 The series follows best friends Issa (Rae) and Molly (Orji). The duo tries to deal with their own real-life flaws, even as they attempt to navigate different worlds and cope with an endless series of uncomfortable everyday experiences. Rae also co-created the series with Daily Show vet Larry Wilmore. Four episodes of the current third season have aired thus far, averaging a 0.29 rating in the 18-49 demographic with 657,000 viewers. That’s way down when compared to season two but that season’s ratings were elevated due to airing on the same night as Game of Thrones, currently HBO’s biggest series. HBO also renewed Ballers for a fifth season today. The newly ordered seasons of both Ballers and Insecure are expected to air in 2019. LOS ANGELES, Sept. 6, 2018 – HBO has renewed the comedy series BALLERS for a fifth season and INSECURE for a fourth season, it was announced today by Amy Gravitt, executive vice president, HBO Programming. What do you think? Are you a fan of the Insecure TV show? Do you plan to keep watching this HBO series? I love this show. I want to see more. I wish issa would get with Daniel. Or nathan ..just one of them ..please keep the show ..how can i get the ratings up? !